As of 2001, the population was about 175,000. California sea lions have increased 3 to 4-fold since the 1970s due to limitations placed on killing and harassment by the United States and Mexico. Adult males are dark brown to black with a sagittal crest, tuft of hair on their head. Males have a robust chest, shoulders and neck, and a slender hind end. They lack the well-developed mane typical of other sea lion species. Females and juveniles are tan to yellow-ish and slender in form. Males are larger than females weighing up to 1,000 pounds and 220 pounds, respectively. California sea lions breed at the Channel Islands off southern California, and at islands around the northern Pacific coast and along the east coast of Baja California. California sea lions have nine pairs of teeth in the upper jaw and eight pairs in the lower jaw that enable them to feed on a diverse diet including northern anchovy, market squid, sardines, Pacific and jack mackerel, and rockfish. Males of populations in northern California use the mouths of rivers and streams to catch lampreys, salmon and eels. They also enjoy stealing fish from commercial and sport nets. These sea lions are agile swimmers and can dive to depths from 245-1,760 feet depending on the season. Males have more than one reproductive partner at the same time. They compete for females using physical displays, vocalizations and sometimes combat. After giving birth, females remain ashore with their pups for 7 to 10 days before they return to sea to forage. A two to five-day routine of foraging at sea and nursing ashore continues until 6 months when pups are usually abruptly weaned. Females usually live to 20-30 years of age and males do not live quite as long. 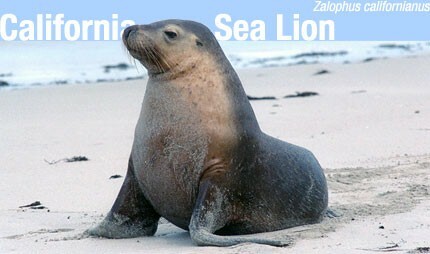 California sea lions have two main predators; the Great white shark and the killer whale. Natural events such as El Niño, exacerbated in recent years by global warming, can result in pup and juvenile moralities and declines in pup births. Human-related threats include entanglement in fishing gear and toxic impacts from pesticides. This entry was posted in Fauna and tagged California Sea Lion, fauna on December 5, 2011 by bellohorizontemx.